Sadly the comics on the picture above will be the last issues of the titles Mickey Mouse, Donald Duck and Duck Avenger we’ll see from IDW. At least for now, but hopefully they will continue again sometime in the future. For Donald Duck and Mickey Mouse it’s not a definitive end as they will be replaced by a new series Donald and Mickey scheduled for an August release. 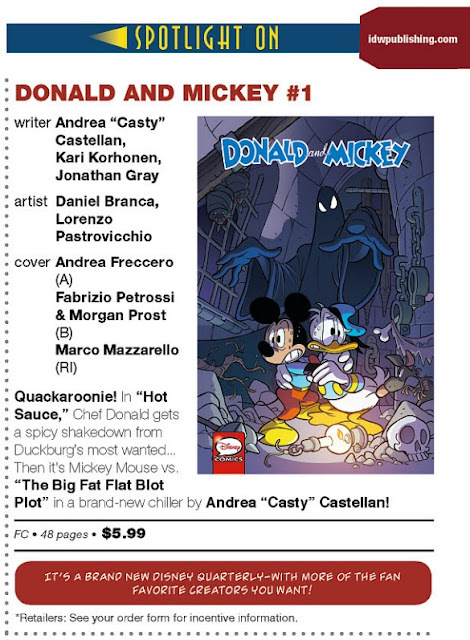 Donald and Mickey will be a quarterly series in a "prestige format", which means more pages than the regular issues. 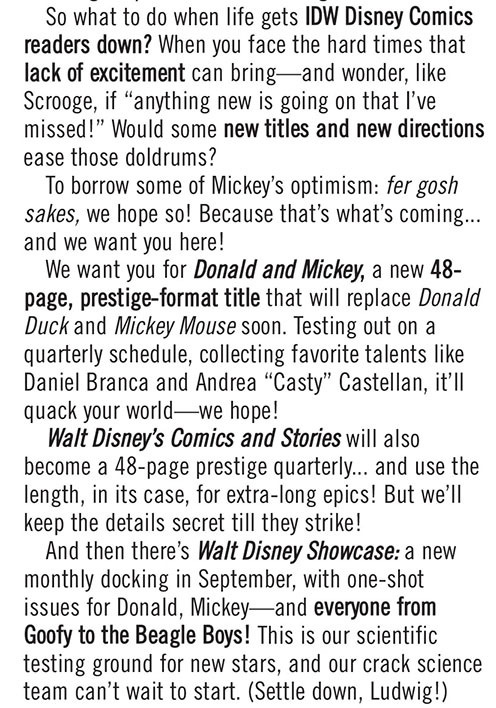 Walt Disney’s Comics and Stories will also be changed to a quarterly series in the new prestige format. We’ll see the first issue in this format next week with a new story in the Tamers of Nonhuman Threats series that wouldn’t been able to fit in a single issue of the old format. So the changes are not all bad news. But the worst part of the changes is that Duck Avenger has an uncertain future. I was really hoping for a full run of the PKNA series! For now the series seems to have been canceled, but we got this message on the last page in issue #5. I’m not 100% sure where they want us to write in; the only e-mail address in the comic is for licensing purpose. But they do have links to facebook, twitter etc. inside. The Crosstalk page in the June issues has some more information about the changes. As you can read we’ll also get a new series Walt Disney Showcase. The text say September, but the series was not listed in the "July for September" Previews catalog. I’m curious about and looking forward to this series, so hopefully we’ll get some more information about it in next moths catalog. 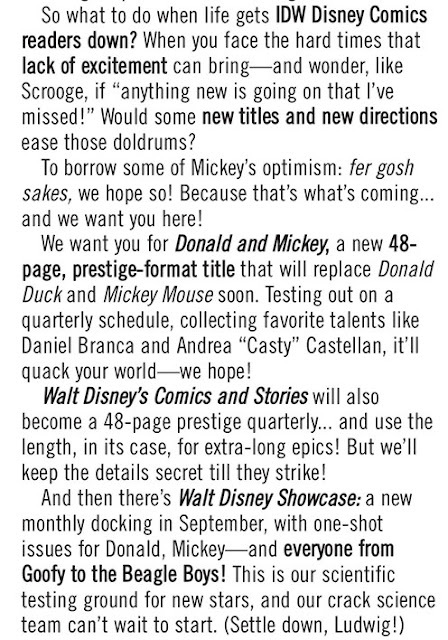 Not mentioned in the text above is DuckTales that’s also a new series from IDW starting up this month. 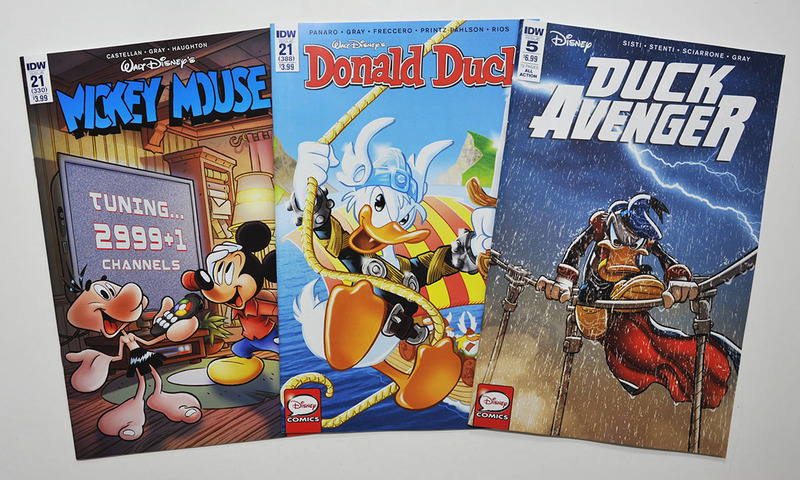 So even with some bad news there are still a lot of Disney comics from IDW to look forward to! Interesting to note is that Mickey Mouse and Donald Duck didn’t continue during the Walt Disney Publications’ run of Disney comics between what fans call Gladstone I and Gladstone II. But both Uncle Scrooge and Walt Disney’s Comics and Stories continued during the W.D. Publication time (and will continue now too). Hi there, do you have a contact email where I can reach you regarding editorial? I've now added a simple contact form on the right sidebar. Its a shame, I loved Mickey and WdC&S titles, I also though about starting to collect Donald, Scrooge I wasnt to keen on, for me Scrooge is stuff by Rosa and Barks, while for other characters I love their italian versions. Even do I collected almost all topolino issues that have stories for these comics, they were still something cool to have. I dont know why Scrooge was the one chosen to remain a monthly, for me Mickey would make more sense as he is more popular character or WDC&S which can showcase all characters. Dont know if I will buy new quarterly issues, I m not too keen on paperback format, what I understand this "prestige" is. Hopefully someday these monthlies will come back even though at reduced page size it is not the same, a bunch if not majority of longer italian stories are 30-40 pages as far as I noticed and I think IDW cut down to 32. What I do miss is more classic style stuff like there used to be in the past with Gemstone and others, Jiipes, Van Horn guys, Ferioli, Murry and such..
Actually the "prestige" format is not paperback, but stapled like the regular comics and like the Duck Avenger issues. So it's basicly just an regular comic with more pages (and a bit pricier). I though it was like gemstone wdcs where pages are glued together. When doing statistics I guess we have to look at the number of comic pages and not the number of printed pages. When looking at the situation right now the Uncle Scrooge title usually has 44 pages with 32 pages of comics at $3.99 and WDCS has 48 pages with 44 pages of comics. So the “prestige” titles are slightly more expensive. All titles used to have more pages of comics compared to the total pages, but this changed at the beginning of this year. So even if Uncle Scrooge still have 44 pages at $3.99, we now have more pages of ads than we used to, so this title got a bit more expensive too if we look at it this way. Something seems to be going on with the IDW Disney titles. The next Uncle Scrooge is coming in April, but I don't think we've had an issue released since Dec 2017. And as for Walt Disney Showcase, only ONE issue has come out as of March 2018, yet it was supposed to start last fall. Not good signs for the Disney comics ! The archival editor at IDW explained on the fan forum that the delay was mainly due to people in the approval office at Disney being sick for a while. But staff at IDW also had been ill, and there was trouble getting the source material for Uncle Scrooge #34 (438). They plan on getting back to schedule during the spring, and so far we haven't seen any comics skipped in the Previews catalog. So hopefully this means that we'll see a period with more frequent releases. On more positive news, the Duck Avenger series is not completely dead. A new issue is planned for June this year. But instead of being a bi-monthly series that is later collected in trades, we now just get a continuation of the TPB series with new (to the USA) series in it. And instead of having 3 issues collected in one, it sounds like there will be two in each trade from now on. Not sure how often they plan on releasing these as only one is announced so far. But still better than nothing.